ATV Attachments from Worksaver, Inc. ATV Attachments from Worksaver, Inc. Helps you care for your land. In your wildlife food plots…in your gardens…on your acreage. Elevate your ATV's productivity by converting to Worksaver ATV Attachments. Great for wildlife food plots, gardens and large acreage. Worksaver provides quality designed and innovative products that work the way you live! Designed for quick and easy cleanup of leaves and debris from large areas of lawn, pastures and roadsides – keeps your property neatly groomed. Features spring steel tines spaced at 1” intervals for thorough raking; debris is “windrowed” for easy collection and pick-up. 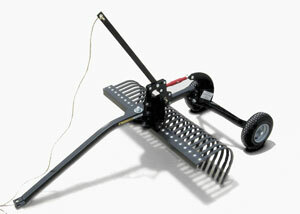 Rakes are available in 4’, 5’ and 6’ widths. 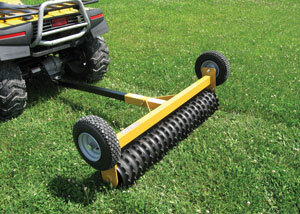 Ideal for tilling wildlife food plots and larger gardens. Patented design allows for easy “flip-over” from transport to cultivation mode. Features eight (8) 16” notched blades designed for efficient trash cutting and optimum soil penetration. Perfect for final compaction after seeding your food plot. Reduces air pockets and increases seed germination. Helps prevent erosion. Unique design allows for easy “flip-over” from transport to operation mode. 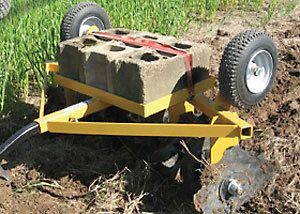 Can also be used for breaking the crust of rain-hardened soil, to allow emerging seedlings to break through and grow.